On Friday, April 27th, CLEOPATRA Entertainment will release in U.S. Theaters MODERN LIFE IS RUBBISH starring Freya Mavor (THE SENSE OF AN ENDING), Josh Whitehouse (NORTHERN SOUL), Ian Hart (GOD’S OWN COUNTRY), Jessie Cave (HARRY POTTER AND THE DEATHLY HALLOWS: PART 1 &2, HARRY POTTER AND THE HALF-BLOOD PRINCE), Matt Milne (WRATH OF THE TITANS, PBS’s Downton Abbey), Will Merrick (ABOUT TIME, BBC’s Skins), Tom Riley (KILL YOUR FRIENDS, Amazon’s The Collection) and Steven MacKintosh (UNDERWORLD franchise, LOCK, STOCK AND TWO SMOKING BARRELS). 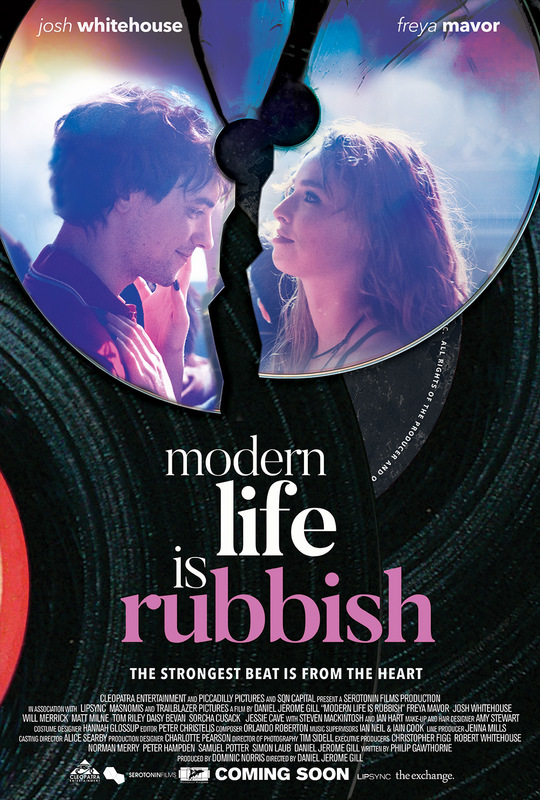 MODERN LIFE IS RUBBISH had its World Premiere on June 22, 2017 at the Edinburgh Film Festival with critical acclaim and was produced by Dominic Norris (GUILTY HEARTS, COMEDOWN) of Serotonin Films and directed by Daniel Jerome Gill (MODERN LIFE IS RUBBISH); Philip Gawthorne penned the script. First brought together by their shared love of music (they met in a record store and debated which BLUR album is the best), ten years on Liam (WHITEHOUSE) and Natalie (MAVOR) have reached a breaking point. Even though opposites attract, they aren’t necessarily long-term. Liam, a struggling musician, cannot let go of his vinyl collection and refuses to adapt to world of smartphones and instant downloads. Natalie has let go of her dream of designing album covers and has become a rising star at her advertising firm. As they make the difficult decision to separate, they start by splitting their prized music library. But the soundtrack that defined their relationship keeps pulling them back together. The U.S. rights deal was brokered by CLEOPATRA Founder and CEO Brian Perera, Tim Yasui, VP/GM of CLEOPATRA Entertainment, and by Brian O’Shea from The Exchange on behalf of the filmmakers. “Cleopatra relies heavily on music-driven and music-inspired films and MODERN LIFE IS RUBBISH fits this mold to a T,” said Cleopatra’s Perera. “Commercial, uplifting and romantic MODERN LIFE IS RUBBISH has a global appeal given its strong musical roots and incredible performances,” said O’Shea from The Exchange. The film features an amazing score that includes songs from RADIOHEAD, COCTEAU TWINS, STEREOPHONICS, THE 1975, THE VACCINES, WARPAINT, THE LIBERTINES, MT WOLF & more!